The U.S. intelligence community declined to conduct a required assessment of the damage to national security caused by former secretary of state Hillary Clinton sending and receiving secrets on a private email server. "ODNI is not leading an [intelligence community]-wide damage assessment and is not aware of any individual IC element conducting such formal assessments," Joel D. Melstad, a spokesman for the of the Office of the Director of National Intelligence, said. The most sensitive classified information leaked and possibly obtained by foreign intelligence services included ultra-secret information on U.S. drone strikes, according to American intelligence officials. James Clapper, the director of national intelligence, agreed with security officials who argued against the need to carry out the damage assessment. Intelligence officials argued in internal discussions that since many details of the drone missile program targeting terrorists were disclosed in earlier leaks unrelated to Clinton’s use of a personal email server, gauging the damage done by her conduct would be difficult, and possibly unnecessary. Melstad, the DNI spokesman, declined further comment when asked the reasons behind Clapper’s decision not to launch the damage assessment. Other officials said Clapper’s decision appeared based on political considerations and was an effort to avoid embroiling American intelligence agencies in charges they were attempting to influence the outcome of Clinton’s bid for the White House. The intelligence about drone strikes was compromised by its transmission on Clinton’s private server. The information is classified above the Top-Secret level and limited to distribution to a few officials in what is called a Special Access Program—an intelligence compartment used to prevent the disclosure of the government’s most secret information. Drone strike intelligence is classified as a part of Special Access Programs in order to prevent revealing the sources and methods used for targeting terrorists with missiles fired by unmanned aerial vehicles, a signature tool of President Obama’s counterterrorism policy. 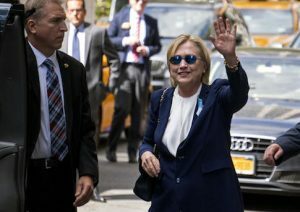 Clinton, the Democratic presidential nominee, lied repeatedly about her handling of the unsecure email server, initially saying no classified information was sent in the private emails, and then asserting no information that was marked classified was sent and received during use of the server between 2009 and 2013. Both claims were disputed by an FBI investigation that concluded in July. FBI Director James Comey said among the 30,000 emails obtained from the server, "very sensitive, highly classified information" was found, including seven email chains containing Special Access Program secrets. "These chains involved Secretary Clinton both sending emails about those matters and receiving emails from others about the same matters," Comey said. "There is evidence to support a conclusion that any reasonable person in Secretary Clinton’s position, or in the position of those government employees with whom she was corresponding about these matters, should have known that an unclassified system was no place for that conversation." The Intelligence Community inspector general had requested the investigation focusing on the transmission of classified intelligence on emails sent and received by Clinton and her aides. A June 2014 counterintelligence directive requires the Intelligence Community to conduct damage assessments in the aftermath of unauthorized disclosures or other failures, such as espionage cases. The directive, ICD-732, states that "damage assessments shall be conducted when there is an actual or suspected unauthorized disclosure or compromise of classified national intelligence that may cause damage to U.S. national security." A member of Congress and three intelligence experts disagree with the DNI’s decision not to conduct the assessment, which they assert is needed to prevent further national security damage. Rep. Mike Pompeo (R., Kan.), a member of the House Permanent Select Committee on Intelligence, wants the DNI to do a formal damage assessment. "FBI Director Comey has made clear that there was highly classified and sensitive information on Secretary Clinton's personal server," Pompeo said. "It is imperative that an investigation be conducted to determine what harm to American national security may have occurred and, just as importantly, to prevent the massive mishandling of sensitive materials from ever happening again." Pompeo said the refusal to do the damage assessment, despite the FBI’s determination that a serious leak of national security data took place, "is inappropriate and a grave failure." Angelo Codevilla, a former intelligence officer and former Senate Intelligence Committee staff member, said the FBI director’s vague and evasive comments regarding Clinton’s handling of classified information confirm that she compromised a significant number of secrets. "Common sense, the intelligence community’s standard practice, as well as a 2014 directive, require assessing the damage done by any such compromise," Codevilla said. Politics in support of Clinton also appeared to be behind the decision. "The DNI's refusal to conduct such an assessment, even more than the FBI director’s obfuscation, shows that U.S. intelligence agencies have been reduced to mere political arms of the Democratic Party," Codevilla added. "Whenever there is a significant compromise of national security information, as the FBI’s report confirms happened here, it is essential to conduct an assessment of the damage in order to protect plans, programs, or lives that may be at risk," she said. "The FBI has done a first cut at identifying classified information that was transmitted to or from the secretary of state in the ‘open’—which means even any second-rate intelligence service could scoop it up," she added. "So you have to assume the Russians, the Chinese, the Iranians, and a host of others, have their hands on it all." Van Cleave said that under a DNI directive a damage assessment team is responsible for looking at the information that was compromised and analyzing the potential harm to national security, "so we aren’t going along blindly thinking all is well when it isn’t." An FBI report on the server investigation stated that foreign hostile hackers penetrated computer systems of people who communicated with Clinton through the private email. "The FBI did find that hostile foreign actors gained access to the personal email accounts of individuals with whom Clinton was in regular contact, and, in doing so, obtained emails sent to or received by Clinton on her personal account," the report noted. The report did not identify whether the emails obtained by the foreign hackers included classified information. Comey said in July that "sophisticated adversaries"—code for states such as Russia and China—likely gained access to Clinton’s private emails. "Intelligence agencies hate conducting damage assessments that could show people that somebody did something wrong, or improper, or did it poorly," deGraffenreid said. "They never want that known. It’s a bureaucracy that does one thing: protects itself." In the past, intelligence agencies ducked conducting damage assessments by claiming the assessments could not be conducted without interfering with law enforcement investigations or prosecutions. Both the FBI and Justice Department, however, have said the investigation of the Clinton email server was completed and prosecution declined. A special intelligence unit with access to secrets but which is independent of any political pressure from intelligence leaders should be created, he said. "These assessments can’t simply be done by the people in the agencies involved," deGraffenreid said. "That would be like allowing inmates to do an assessment of their crimes." Congressional sources said the House and Senate intelligence oversight committee are reluctant to require the damage assessment since it would codify in writing the false claim that no damage was caused to the drone program by the compromise of secrets by Clinton and her aides. The Obama administration has suffered a string of highly damaging security failures, including the theft of some 250,000 secret documents stolen by Bradley Manning, a soldier in the U.S. Army, and given to Wikileaks. That compromise was followed by the theft of some 1.7 million highly classified documents on electronic intelligence gathering from the National Security Agency by renegade contractor Edward Snowden, currently wanted on espionage charges and living in Moscow. A Clinton campaign spokesman did not respond to an email requesting comment.